Egypt has been conjuring up images of revolution, of military intervention, of chanting crowds on Tahrir Square, of hope, islamic autocracy and unstable democracy. But it’s easy to forget life as normal with such imagery, of mothers chasing their little ones out of the pantry with shouts of rebuke, out the back door, down a sun crowned back alley as they dash away with a smuggled jar of mum’s finest. Unlike za’atar’s competitive regional differences, dukkah doesn’t enjoy such incredible local distinction. But extraordinarily we can see a parallel with the palestinian pride in family recipes, in the huge variety of dukkah recipes on sale on the australasian shelves, 10,000 miles away from Egypt, and some distance away from the original recipe. All good stuff, though, and a great way to create a dry, nutty, herb flavour to your dish. On it’s discovery, I made a bumper batch and handed my additional lot out to friends as I loved it so much I thought I’d share the love. So here’s a quick recipe hint – try crusting your chicken in dukkah, and throw together a lemon, mint, parsley and quinoa salad. Turn the oven on to 180C. On a baking sheet, toast the sesame seeds for 2 minutes, then give them a shake and stir and bake for another 2. Set aside your sesame seeds in a food processor, keeping the sheet and adding the hazelnuts and chickpeas for 3 minutes, stir and shake and then another 3. Add them to the food processor with the rest of the ingredients and blend. 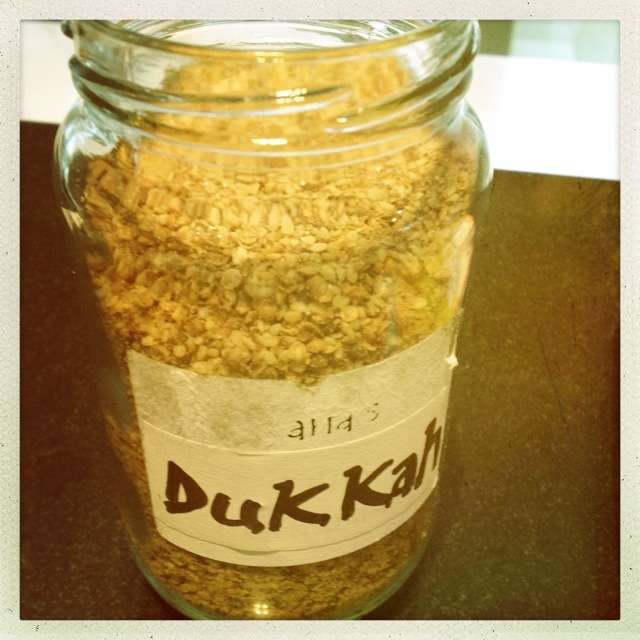 Traditionally, a pestle and mortar would be used to crush the ingredients, hence the name dukkah, which derives from the word meaning “to pound”.